Magnolia original art greeting card, botanical illustration wall art. Bleeding heart plant original art greeting card, botanical illustration wall art. Fuschia original art greeting card, botanical illustration wall art. Cherry blossom original art greeting card, botanical illustration wall art. 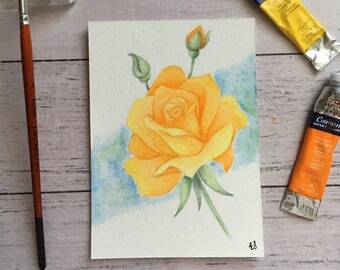 Rose original art greeting card, botanical illustration wall art. Peony acanthus pattern original art greeting card, botanical illustration wall art. Bamboo japanese pattern original art greeting card, botanical illustration wall art. Art Nouveau rose original art greeting card, botanical illustration wall art. Art Nouveau poppy original art greeting card, botanical illustration wall art. Art Nouveau tulip original art greeting card, botanical illustration wall art. Art Nouveau peony original art greeting card, botanical illustration wall art. Watercolours are the classic medium for botanical art. I love how forgiving they can be! After quite a bit of experimentation, I found the right way to reproduce the artwork so that it can safely be glued. Some findings come complete, but others I assemble myself to create something unique! Each item is carefully packaged with professional presentation, ready to be gifted. And here's the reason for it all, my beautiful boy. Thank you for supporting my small family! Liliflora Pretty is named for one of my favourite flowers: Magnolia Liliflora. Its stunning elegance evokes romance and whimsy. My purpose in creating Liliflora Pretty is to help you bring that same elegance and inspiration into your world. It all starts with a collection of illustrations and inspired by the beauty of flowers. These are then printed on high quality paper before being handmade into gorgeous, easy to wear jewellery pieces. Designed to help you express your love for romance and celebrate nature's gentle beauty, Liliflora Pretty's product lines are created with you in mind. My passion for creating beautiful art is supported by my desire to only offer you the best products I can make that showcase the designs printed on them and are also items you will fall in love with. I hope they bring you joy when you display, wear and share them. Emma is the creator behind everything you'll find here at Liliflora Pretty. I adore flowers and use art to celebrate them and the other tiny wonders of the natural world. My purpose is to create beauty and share it with you! Please advise when ordering if you require necklaces or bracelets to be shorter than advised in the listing. If you require them to be longer, please convo me before ordering to check that this option is available. A care card and polishing cloth is included with all jewellery items. Please note that as these are plated base metals, they will tarnish and patina over time. Using the cloth will protect them and keep them from looking dirty. Some items may have a clear protective coating on them to delay tarnishing. This can be removed with nail-polish remover wipes if it starts to look dirty. You can use clear nail polish as a coating. This is particularly good for the bracelets as they have the most contact with your skin. All Liliflora Pretty items come beautifully and professionally packaged to ensure they will arrive safely and make the perfect gift on arrival. Jewellery is shipped on sturdy backing cards, wrapped in tissue paper and packaged in a decorative bag. A thank you card, business card and cleaning cloth are also included in the packaging. It is possible for me to produce my work at wholesale quantities. Please convo me for more details. Please note I operate on a 'wholesale only' policy, I do not offer 'sale or return' terms.